Last month, I purchased a bottle of honey which I was planning to use as part of my skin care routine. I've been dreaming of it for like forever when finally I was given the chance to include it in my daily routine. (Like it was an achievement! Weird!) 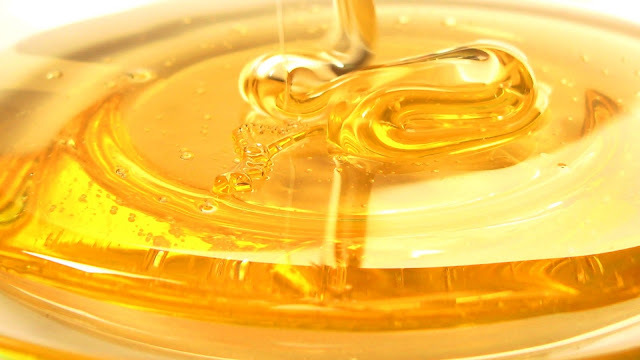 I was that eager to know if honey really works well on my hair, face, and body after reading so much about its beauty effects which was proven by so many beauty enthusiasts out there! And I was never disappointed! After a month use, I already notice changes on my skin! Well, actually, you'll notice a big change the first time you include honey on your hair and face mask! This is a serious thing, guys! Lol! I suggest that you buy the organic one instead of the raw to make sure that it has no chemicals in it. I just bought this since I can't get to find honey that is raw and organic at the same time in every supermarket I've visited. I don't know if it's very hard to process or what, it's just that it's the only brand and size available that time so I had no choice but to grab it. I believe that supermarkets nationwide should have honey in most brand and size, you just have to ask. Actually, I was looking for a smaller bottle while roaming around the supermarket like a hundred milliliter but I failed. Since I aimed to just test this natural sweetener if it really was beautifying, I before preferred to buy a small bottle which I can already toss away if ever it fails to meet my expectations. But it surpassed them unexpectedly! Now, I am really disappointed of myself for not buying the biggest one because I am running out of stock, and I am not able to get another bottle for me as of the moment! Anyhow, let's go to the center of this blog post! Honey! Honey! Honey! Honey, like everyone knows, is a natural sweetener made by honey bees using the nectar from flowers. People mostly eat the honey which they included on pancakes and such to add flavor to it. However, it can also be a good substitute for processed beauty products since it's a lot cheaper and as effective (or more effective) than they are that's why beauty enthusiasts, like me, include this ingredient on our beauty regimen! Treatment of damaged hair. If you always blow dry your hair, apply coloring treatments and other styling treatment, you better use this ingredient and add it to your hair mask since it has great healing properties! I usually add honey on my hair spa treatment together with olive and coconut oil and tada! I get that smoother, shinier, stronger and softer hair! Moisturize hair. Honey attracts moisture. Whenever I use honey, I feel like my hair is full of moisture without the heavy feeling on my hair. It also adds volume to it. Acts as an emollient. Honey softens your hair and is responsible for natural hair growth. In fact. you can substitute this with your conditioner. Just don't forget to rinse your hair out, otherwise your hair will get bombarded with sweet addicts, kidding! Hahaha! Antioxidant. Honey protects your skin from harmful rays of the sun and other harmful radicals. Moisturizes your skin. Not just it moisturizes your hair, but your skin as well! I notice the effect much on my skin than hair, actually. I use this alone on my face after cleansing and it leaves my skin brightened and improved elasticity! A good exfoliator. For my scrub, I use honey together with brown sugar and olive oil, leaving my skin so soft and smooth, I don't even need to apply lotion all over my body. I also use this frequently as a hand and foot scrub and I really love the results! And whenever I use this on my face after patting my skin dry, I notice that my skin looks bright and polished! Treatment for eczema. Manuka honey treats damaged skin and helps in regenerating the cells of your skin, making it a perfect ingredient to get read of those rough and bumpy layers of your skin! Underarm whitener. I also use honey to whiten my underarm! Not just it whitens, it also gets rid of those unwanted bumps! Just don't forget to mix it together with sugar and lemon/lime for added lightening effect! And achieve those smooth and soft underarm layer! And that's it guys! What I wrote here is purely my own experience! I may forget some other benefits of honey but I am yet to discover them! See you on my DIY treatments for hair and skin soon! Happy blogging!